Ariana Grande. Ariana Grande at behind the scenes for iCarly.. Wallpaper and background images in the Ariana Grande club tagged: ariana grande 2011. 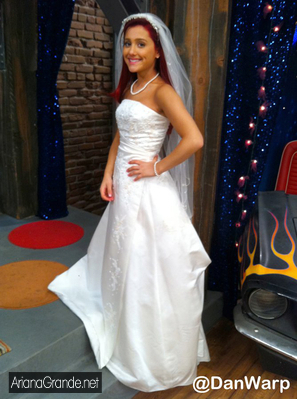 Ariana Grande at behind the scenes for iCarly. This Ariana Grande photo contains bridesmaid, maid of honor, and gown. There might also be bridal gown, wedding gown, wedding dress, dinner dress, dinner gown, formal, evening gown, gown, and robe.